EBikes are great! Lots of ground and info covered in a relatively short period of time. What an absolutely FUN day! We'd never e-biked before and frankly I thought it was a little bit of the lazy way to get around BUT now that we've done it, we'll do it again and again. WHAT AN AMAZING WAY to see a city and cover a TON of ground literally :- So the e-bikes were easy to operate, our guide took the lead and we made frequent stops to hear about the history of the area. 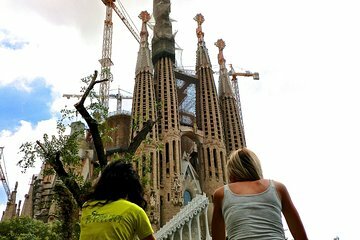 Despite having done a lot of research before going to Barcelona, our guide had amazing stories, was funny, keep things light-hearted and shared places and stories we'd not heard of. This was an awesome way to spend 3 hours. AFTER the tour was over, we returned and then rented the e-bikes for the remainder of the day and covered more territory on our own going from the far beaches all the way to the top of Montjuic and even north of La Sagrada. Our guide was young and energetic and perfectly suited for the tour operation! ONE NOTE, due to our late booking, La Sagrada was sold out so we could not go in the same day, BUT the e-bike operator secured tickets for us and we were able to do the tour a couple days later which worked out just fine for us.No matter how you get into La Sagrada, it is worth it. As outrageous as the exterior is IMHO, the interior is simply stunning. Our tour included a self-guided audio tour component, but we opted to simply walk and take photos on our own. All in all, the e-bike tour rocked!! Fantastic way to see the sights and get your bearings when in Barcelona. Our guide Geordie was very knowledgeable of the area and history of Barcelona. The E-bike made light work of reaching the heights of Mont Juic and made cruising the streets of Barcelona pleasurable. High recommend!! My wife and I had a fun tour. We were met on time at the fountain and promptly got to our bikes and had a brief training and introduction to the tour. The first thirty minutes or so was tough because of the amount of people in the streets. It seems all the day tours start at about the same time and take the same route, so it is very congested for the bikes to get through the narrow streets with all of the other tours about. Once we got out of the tight quarters and got to the Born district the streets opened up and we really got to have some fun on the bike. Our group of ten was a bit large as we tended to get spread out on the busy street leading up to the Sagrada Familia. After an hour there we had a fun cruise through the city to return to the bike shop. The guide was fun and we had no trouble with the bikes. I'd recommend. This tour was amazing. Only four of us with excellent guide Marco. E bikes were fun. We saw so many great places ending in the magnificent sagrada familia. Highly recommend tour. This bike tour is AWESOME! We loved it and the time spent with our guide, Marco. He was so informative and entertaining. It rained on the day of our tour, but it made it even more fun. The bike tour, with the La Sagrada tour included, kicked off a fabulous first day of exploring Barcelona. Marco gave us great recommendations for fideua and Spanish hot chocolate for lunch after the tour too. They did NOT disappoint! We even teamed up with another couple from the group and spent the rest of the day together touring the city. What a magical day thanks to that bike tour! The E Bike was fun and certainly one of the best ways to get around the city. We had fun and the trip was personalized. I would encourage anyone visiting Barcelona to do this. Skipping the line to the Sagrada is imperative as that line is long! This tour was our favourite thing from our 4 day trip to Barcelona! It was a surprise for my 21 year old daughter - who normally wouldn't go anywhere near a bike! To my relief she loved it (using the electric bike up hills is a dream!). We saw so much and loved SF thanks to Nadim, expert guide!